This composite image of star-forming gas clouds in the Milky Way was taken by the recently launched Hershel telescope, and released Oct. 2, 2009. The recently launched Herschel Space Telescope has justreturned glowing pictures of our own Milky Way galaxy in infrared light. The European Space Agency mission (with contributions fromNASA) liftedoff in May on a quest to observe the universe in long-wavelength infraredlight. The telescope used two instruments simultaneously to snap the new MilkyWay photos in five different ranges, or "colors," of infrared light,which is invisible to human eyes. "Herschel's infrared vision lets us sense the feebleheat from some of the coldestobjects in the cosmos," said Paul Goldsmith, the project scientist forthe mission at NASA's Jet Propulsion Laboratory in Pasadena, Calif. The new images, taken during the observatory's testingphase, reveal new details of a region of the Milky Way near the dense plane ofthe galactic disk. In this region large clouds of gas and dust are giving birthto hordes of new stars. Much of this region is shrouded in normal ranges of light,but Herschel caught its diminfrared glow, which revealed that this star-forming region is even richerin cold and turbulent material than previously believed. 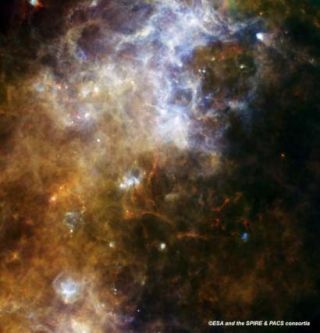 Gas in the clouds appears to be condensing in a continuousand interconnected maze, with filaments of baby stars visible in all stages ofdevelopment. In the color-coded image, blue shows warmer material, redrepresents cooler matter, and green shows temperatures in between. The coldestdust can be seen in thin string-like structures. The images were made by Herschel's photodetector arraycamera and spectrometer (PACS), as well as its spectral and photometric imagingreceiver (SPIRE). Using the instruments simultaneously produces five images atonce in different wavelengths. The observations also serve to confirm that theinstruments onboard Herschel are working as expected. "We had high hopes for this kind of observation withHerschel, using the combined power of the two cameras to see the galaxy asnever before," said Matt Griffin of Cardiff University, principalinvestigator for the SPIRE instrument. "It?s great to see that the observationswork so well from a technical point of view, and that the scientific results areso spectacular. It appears that star formation in the galaxy is a veryturbulent process." Scientists hope that futureHerschel data will help shed new light on the history of star formationthroughout the universe.